Licensed games almost always give players an instant headache. That’s not exactly a shocking thing to hear. So many licensed games are clear cash grabs, from boring re-skins of older successful titles to rush jobs that are so barely thought-out that they’re essentially unplayable. Still, it doesn’t hurt to have a little bit in faith in the usual kiss of death that comes with a game about your favorite piece of media. In the world of videogames, Batman was able to fight his way out of mediocrity with the Arkham series and it can (and has) happened in boardgames. For example: every game on this list. They are all top quality boardgames based on licensed properties. If you are a fan of the franchise in question, every one of these games is pretty much a must buy; even if you’re not, they’re all worth playing. In no particular order, here are our picks for the best licensed boardgames. Not only is Battlestar Galactica considered to be one of the best licensed boardgames, it is also one of the best games of all time, period. 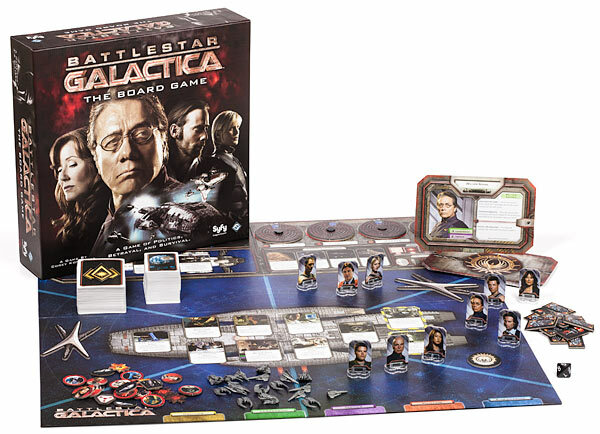 Battlestar Galactica is a semi-cooperative thematic game where players take on the role of one of the ten characters from the Sci Fi Channel series. You can sense where things will go next—players have to work together and overcome their weaknesses to survive for the good of the human race. The kicker is that one (or more) of the players is secretly on the side of the Cylons. Things will get very tense and can take the turn for the worst with a single card draw. Don’t expect the game to calm down during the three hour (if not longer) session it will take to play, especially since a second set of traitor cards will be passed out as you near the end of your mission. This is a must own for fans of the series and for anyone interested in a thematic game in space. I love Game of Thrones. The action, the romance and the political intrigue over the Iron Throne is the perfect recipe for a great TV show. Does that apply to a boardgame? Well, it depends on how much you value friendship. A Game of Thrones: The Board Game has a good chance of destroying relationships that have taken years to craft in a measly three hours. Although it’s technically based on the source material of the HBO series, I have never witnessed a boardgame fit a theme as well as this. At face value, the game is a war game where your kingdom must control the most land, but it can be gained through carefully crafted diplomacy instead of the force of a powerful army (Littlefinger v. Stanis). 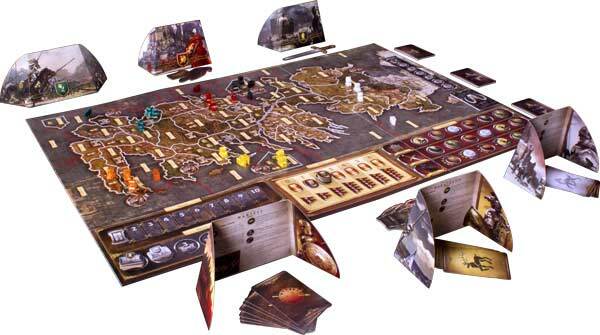 A Game of Thrones: The Board Game is notorious for its backstabbing element—there is no way to win without backstabbing at a certain point. It’s up to the player to decide the right time to do so, and whether to give any of the players even a shred of trust. It’s a perfect way to get your mind off waiting for the new season on HBO—you won’t regret it (but your friends might). Are you a fan of RPGs and Star Wars? If you are, you’ll fall in love with Star Wars: Imperial Assault, a dungeon crawler in the Star Wars universe complete with a plethora of miniatures. The game, which had an incredibly anticipated release last year, has a huge fan-base, as you would expect to see with Star Wars in the name. An Internet search will pull up tons of pictures of the gray miniatures being painted vivid colors. 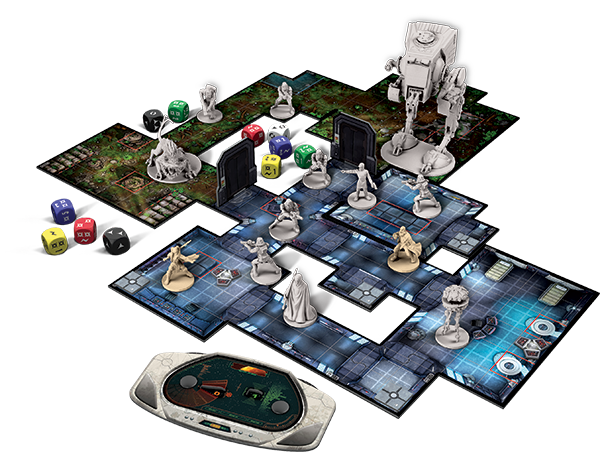 In Imperial Assault, one player plays the gigantic Galactic Empire, while up to four players take control of the Rebel Alliance in an attempt to take them down. 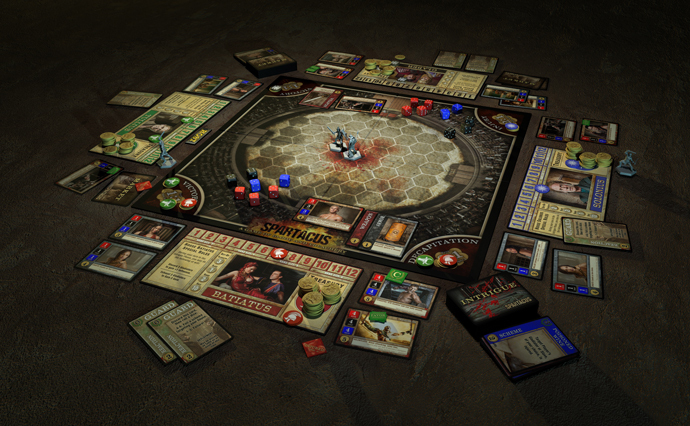 The game is a reimplementation of Descent: Journeys in the Dark, which is known for its dice system. In the system, players will be building their sets of dice up to allow for different sets of attacks and moves. Match that dice system with a set of command cards that players will gain throughout their skirmish and you have an experience that will be a bit different every time. Even if you’re not a fan of Star Wars you won’t regret picking up Imperial Assault. When you think of a series on Starz, you don’t automatically connect it with enough success to cause a release of a boardgame, much less an excellent one. The goal in Spartacus: A Game of Blood & Treachery is to become the most influential house in the land, which you’ll attempt to do through both diplomacy and battle. Players will receive three cards each turn, and it’s up to them whether they want to sell or trade them. These decisions can lead to some interesting choices that will reek of betrayal. Luckily, you can get that sweet payback in the arena by choosing to fight your choice of an opponent. The game is immersive to the point that you will feel like hanging out in a colosseum. Or maybe that’s just because you’re about to take your revenge on your backstabbing friend a bit too far. If you are a fan of the Starz series, love backstabbing your friends or are just looking for a fun game to play on a Saturday night, check out Spartacus. OK, this will be the last Star Wars game on the list. In all fairness, the Star Wars franchise has a plethora of solid boardgames, as well as some mediocre ones, but Star Wars: X-Wing Miniatures Game has such a cult following it would be a shame for it to miss the list. It’s a tactical combat game that features some of the most gorgeous miniatures that you’ll ever see. In fact, the miniatures are so well detailed that they are popular among collectors who will never bring them onto the battlefield (shame). Each ship in the game has a unique set of possible movements, which is decided in secret during each turn in any of the chosen missions. Mix that with a taste of randomness decided by a set of cards and dice rolls and you’ve got a game that has enough replay value to be the main event at worldwide tournaments. Even though the base game has enough to get you started, be well aware of the potential money sink headed your way before making the jump—it’s hard to resist the miniatures. 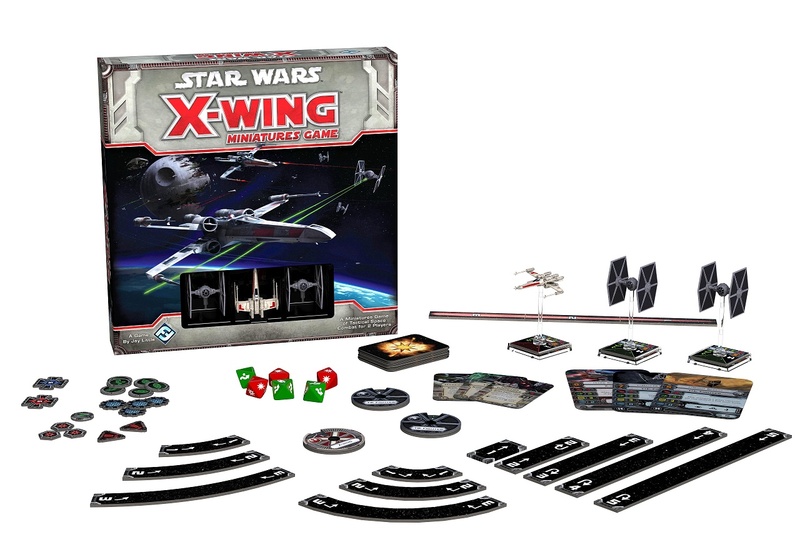 If you’ve got a friend to play with and plenty of tablespace, X-Wing should be a given. If I passed by the Firefly: The Game box in a store, I’d normally run far away like it had the plague. But then I’d be wrong. Very, very wrong. The game is a standard pick up and deliver title—the goal is to use your ship to complete a variety of different tasks for money. The money you gain on jobs is then converted to points at the end of the game. Throughout the journey you will be upgrading your ship, hiring new members to your crew and trying to sneak some illegal goods on the way. Firefly is a simple game that has a huge luck factor, but there’s absolutely nothing wrong with that. The game fits the theme very well and would be a ton of fun for anyone into space-themed games. It’s not heavy, but it’s not trying to be. If you’re looking for a game to play at your favorite bar with some friends, Firefly is a great choice. Just like Star Wars, it’s not shocking that you can find a quality boardgame in the Marvel Universe. 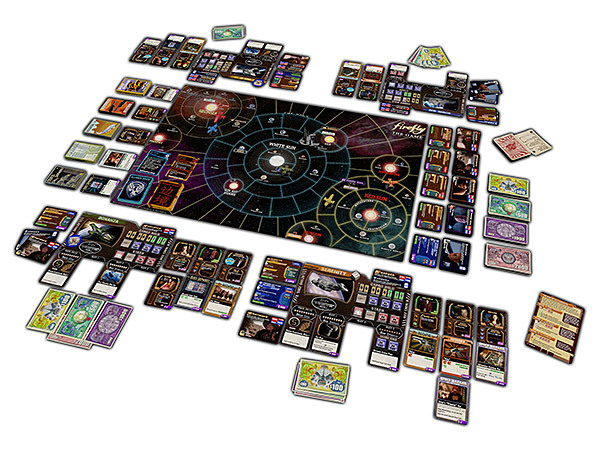 Plenty of players know the deckbuilder genre pretty well through competitive experiences like Dominion and Star Realms, but Legendary: A Marvel Deck Building Game flips the genre on its head by turning it into a cooperative experience. Players will pick out a villain from the Marvel universe to defeat that will be controlled “automatically.” Players will individual build their decks to their liking to take turns attacking the enemy. Hopefully the villain’s henchman won’t get away, because if enough do, you and your team will lose. Although there’s no way to avoid working together, there is a competitive element. You will keep track of all of the bad guys that you’ve defeated, which will add to your tally of points. If you have the most points, naturally, you’ll come out as the winner of the table. But hey, it’s still a shared victory for mankind at the end of the day. 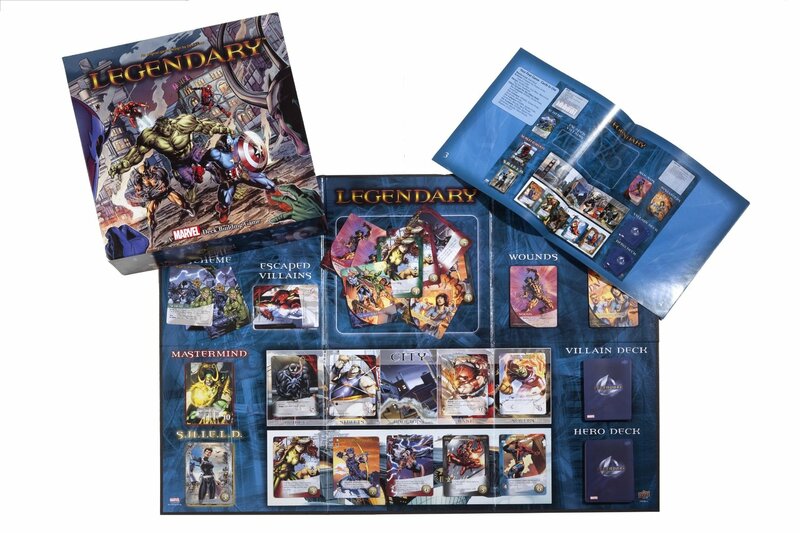 If you love card games, Marvel and/or games you can play with your friend, Legendary: A Marvel Deck Building Game deserves to be in your collection. Civilization V is one of my favorite video games. Thinking about throwing that experience onto my table leads me to nothing but happy thoughts. Sid Meier’s Civilization: The Board Game is a heavy boardgame that gives you the responsibility of guiding your civilization through the ages and hitting on all of the big decisions that go with trying to create the world’s greatest dynasty. That means balancing technology, economy, culture and military—and doing it better than your friends at the table. Just like in the videogame, you can choose your path to victory, which instantly increases the different ways to play the game, even just between the players at the table during a single session. The best part about this game is that you can get through an entire session in much less time than the videogame, although you’ll still need to block off at least three hours of your day. Fans of Sid Meier’s work and players looking for a heavy (but not as massive) strategic experience will fall in love with Sid Meier’s Civilization: The Board Game. Jay Egger works in digital media in Austin, Texas and writes whenever he gets the chance. You can catch him playing boardgames while drinking fancy beer. His Twitter handle is @jayeggr.